[LIFETIME WARRANTY HAMMOCK]: High quality with a reasonable price, perfect choice for cost-conscious traveler, coming with a life-long warranty and best custom support. [LIGHT WEIGHT HAMMOCK]: High fiber breathable 210T nylon of 500-pound capacity; diversified color and soft to touch. [STRONG HAMMOCK]: Braided nylon rope recognized by UIAA with extended diameter (0.31in) and strengthened inner core, holding up to 1100lb. [STURDY HAMMOCK]: Hanging carabiners made from galvanized stainless-steel, widened diameter of 0.31in and strongest on the market, able to bear 880lb. [MULFUNCTION HAMMOCK]: ideal for hiking, camping, boating, traveling, back-yarding, beach & lake, or just relaxing;perfect alternative to a tent, sleeping pad, ground mat, swing, cradle, and yoga mat. [Soft Hammock]: High fiber breathable 210T nylon of 500-pound capacity; diversified color and soft to touch. [Durable Hammock]: Seamless triple interlocking stitching to maximize hammock strength. [Sturdy Hammock]: Sturdy hanging carabiners made from 7075 Aerospace Aluminum Alloy, able to bear 2500lb. [Integrated Hammock]: Compacting hammock down to a grapefruit size, used for holding food, bottles, phones, etc. [Portable Hammock]: Easy to assemble, done in minutes without any tools. 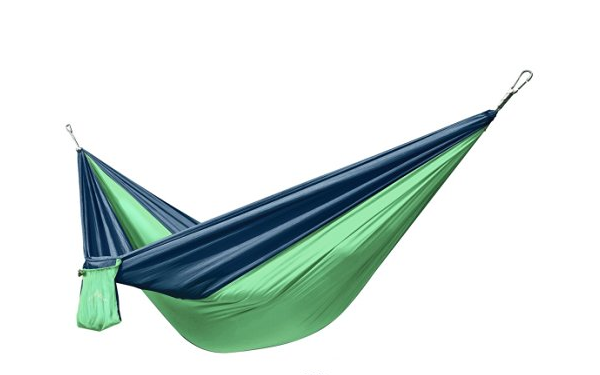 [Mulfunctions Hammock]: Ideal for hiking, camping, boating, traveling, back-yarding, beach & lake, or just relaxing;perfect alternative to a tent, sleeping pad, ground mat, swing, cradle, and yoga mat.